Most interesting fact: Is a fully qualified HP UNIX engineer (and one of the only female engineers in the country)! Katherine (or Kat to you or I) was born and raised in Bristol and after completing her A Levels won an apprenticeship with Hewlett Packard (the only female in England to achieve this at the time - pretty wow huh?). 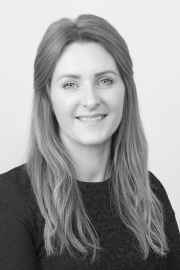 After spending several years at the company, Kat realised her real passion is for property (she is a bit of a property mogul; having purchased her first property at 18, she has been buying and selling ever since!) and joined an agency servicing the countryside surrounding Bristol. Kat joined us in 2015, and she has slotted in nicely, her dry sense of humour, sociable nature and wide knowledge base meaning she has been an instant hit with us and her clients. An ardent animal lover, Kat can often be found walking the surrounding countryside with her partner (a Mechanical and Electrical Operations Manager) and their two gorgeous dogs Molly and Mille.